If you say that you are unhappy, dissatisfied, perhaps ill or impoverished, a failure, this is simply another way of putting the fact that you are not allowing the will of God to have free play in your life— you are not doing the thing that He meant you to do. Discontent is not necessarily a bad thing. It is your duty to be discontented with anything less than complete harmony and happiness. A wholesome discontent with dullness, failure, and frustration is your incentive for overcoming such things. Whoever you are, your true place is calling, and, because you really are a spark of the Divine, you will never be content until you answer. Remember that this call is the call of God, and when God calls you to His Service, He pays all the expenses. Whatever you may require to answer that call—all will He furnish, if you be about His business and not your own. Alcoholics Anonymous will never have a professional class. We have gained some understanding of the ancient words “Freely ye have received, freely give.” We have discovered that at the point of professionalism, money and spirituality do not mix. I believe that Alcoholics Anonymous stands alone in the treatment of alcoholism because it is based solely on the principle of one alcoholic sharing with another alcoholic. This is what makes the program unique. When I decided that I wanted to stay sober, I called a woman who I knew was a sober member of A.A., and she carried the message of Alcoholics Anonymous to me. She received no monetary compensation, but rather was paid by staying sober another day herself. Today I could ask for no payment other than another day free from alcohol, so in that respect, I am generously paid for my labor. The NA program has given us more freedom than we ever dreamed possible. Sometimes, though, in the daily routine, we lose track of how much we’ve been given. How, exactly, have our lives changed in Narcotics Anonymous? The bottom line of recovery, of course, is freedom from the compulsion to use. No longer must we devote all our resources to feeding our addiction. No longer must we endanger, humiliate, or abuse ourselves or others just to get the next “fix”. Abstinence itself has brought great freedom to our lives. Narcotics Anonymous has given us much more than simple abstinence-we’ve been given a whole new life. We’ve taken our inventory and have identified the defects of character that bound us for so long, keeping us from living and enjoying life. We’ve surrendered those shortcomings, taken responsibility for them, and sought the direction and power we need to live differently. Our home group has given us the personal warmth and support that helps us continue living in recovery. And topping all this off, we have the love, care, and guidance of the God we’ve come to understand in NA. In the course of day-to-day recovery, we sometimes forget how much our lives have changed in Narcotics Anonymous. Do we fully appreciate what our program has given us? Just for today: Recovery has given me freedom. I will greet the day with hope, grateful that anything is possible today. “Call on new prospects while they are still jittery. They may be more receptive when depressed. See them alone if possible. Tell them enough about your drinking habits and experiences to encourage them to speak of themselves. If they wish to talk, let them do so. If they are not communicative, talk about the troubles liquor has caused you, being careful not to moralize or lecture. When they see you know all about the drinking game, commence to describe yourself as an alcoholic and tell them how you learned you were sick.” Am I ready to talk about myself to new prospects? Try not to give way to criticism, blame, scorn, or judgment of others, when you are trying to help them. Effectiveness in helping others depends on controlling yourself. You may be swept away by a temporary natural urge to criticize or blame, unless you keep a tight rein on your emotions. You should have a firm foundation of spiritual living which makes you truly humble, if you are going to really help other people. Go easy on them and be hard on yourself. That is the way you can be used most to uplift a despairing spirit. And seek no personal recognition for what you are used by God to accomplish. I pray that I may try to avoid judgment and criticism. I pray that I may always try to build up others instead of tearing them down. We beg of you to be fearless and thorough from the very start. Some of us have tried to hold on to our old ideas, and the result was nil–until we let go absolutely. Action AA tells us that we must be honest about our problems if we hope to overcome them. Some people seem quite w11ling to do this. But an honest admission alone does not solve our problems. We have to go beyond honesty by taking needed action to correct what’s wrong in our lives. For example, we would not believe that any- thing had been corrected simply because a doctor diagnosed a physical problem. We know that such diagnosis is only a preliminary step that must lead to treatment to be effective. In the same way, an honest admission of our alcoholism does not lead to sobriety unless we take further action to ad- dress the problem. We should also be careful about becoming prideful in announcing our shortcomings. If we are recovering from alcoholism but excuse a bad temper as one of our “alcoholic defects,” are we attempting to correct our behavior? The more prideful we are about any fault, the more difficult it will be to change it. Having become honest about my shortcomings, I’ll look for opportunities today to make needed corrections in my behavior. If I find myself using my “alcoholic nature” as an excuse for unacceptable behavior, I’ll take action to do something about it. Style is involved in Spirituality — especially when it concerns the recovering addict. Sobriety and serenity are not just seen in what we say or do or in our ability to keep away from the first drink or pill — they are seen in our creative styles. How we feel about ourselves should be seen in the confidence of our gait and the concern for personal appearance. Personal hygiene is important because it reflects a love of self. Physical health and exercise reveal a desire and interest in life, fitness and energy. Style may not make the man but it certainly reveals the man! May I seek to reveal the beauty You gave me with my appearance and style. From time to time, I begin to think I know what God’s will is for other people, I say to myself, “This person ought to be cured of his terminal illness,” or “That one ought to be freed from the torment she’s going through,” and I begin to pray for those specific things. My heart is in the right place when I pray in such fashion, but those prayers are based on the supposition that I know God’s will for the person for whom I pray, I out to pray that God’s will — whatever it is — be done for others as well as for myself. Will I remember that God is ready to befriend me, but only to the degree that I trust him? I praise God for the chance to help others. I thank God also for making me want to help others, for taking me out of my tower of self so that I can meet and share with and care about people. “Teach me to pray that “Thy Will be done” in the spirit of love, which God inspires in me. I will put my trust in the will of God. At one of the first program functions I ever attended, there were a large number of pots and pans that needed to be washed in the kitchen. My sponsor told me that we were going to go in there and wash all those dirty pans. When I asked why, she said, “Because this stuff keeps us abstinent.” That was good enough for me. Service is essential to my recovery. As our primary purpose states, “we carry the message to the compulsive overeater who still suffers.” The essence of my program is that of committing to service. Since then my service in program has been of paramount importance to me, so I sponsor and serve at the group and Intergroup levels, I attend all events I can, and I am in service at most of the meetings I attend. I encourage sponsees to serve their fellow sufferers also and ask them to sponsor newcomers as soon as they have worked Steps One through Three. This action gets them working on Step Four as well. One of my favorite ways to give service is to be available to talk to newcomers by telephone. As our responsibility pledge states, “Always to lend the heart and hand to all who share my compulsion, for this I am responsible.” A commitment to service is as vital to my recovery as are my commitments to abstinence, working the Steps and a daily food plan. These components mesh together and give me purpose I never had before. I will find a way to be helpful to others in program. “Our Creator makes available to us all that we need. It is an honor to go out and gather it. So many times we forget to say “thank You” to the Creator. He made for us an abundant universe. He built the Mother Earth to reproduce plenty of everything. It is an honor to be a part of the Great Spirit’s world. The Creator always gives us what we need. When we are given things, we should be willing to share it with others. Whenever we give to others, this makes us feel good inside. The more we give, the better we feel. The better we feel, the more we want to give. We need to teach this to our children. The children learn by our behavior. The respect and dignity a couple shows each other set the table from which they are nourished for all other activities in their lives. Any feeling can be expressed in respectful or disrespectful ways. Anger is one of the most difficult to express respectfully. Everyone feels frustrated and angry at times. The crucial thing to learn is how to be angry and still be respectful – how to deal with our impatience without blame or put-downs. Many of us have to learn how to love without being possessive, how to be playful in a lighthearted way with no hidden cutting edge. When we treat our partner with disrespect, we pour poison into our own well. It may feel satisfying at first, but the long-term consequences are not good to live with. When we are committed to respect in our relationship, we continue to learn at even deeper levels what respect truly means. We find that simply listening to each other – and letting in our differences – is a form of respect that nourishes us. Name a difference between you and your mate that you respect. It is a constant source of amazement to some of the Old-Timers to answer a call for help from some alcoholic and to find that the person in trouble is a neighbor, relative, friend or fellow employee or a member of AA. It sometimes happens that the new man preferred it that way as he would rather discuss the matter with a stranger than someone near him. It is also true that some of us are not quick to grasp the opportunities to pass the Message along. If you see a man is beyond his depth and can’t swim, why should you wait for him to yell for help? He might be deaf and dumb. "Selflessness is not a return to the feelings of infancy, an experience of undifferentiated bliss, or a merger with the Mother -- even though many people may seek such an experience when they begin to meditate, and even though some may actually find a version of it. Selflessness does not require people to annihilate their emotions, only to learn to experience them in a new way." THE ONLY REQUIREMENT. . .
“At one time. . .every A.A. group had many membership rules. Everybody was scared witless that something or somebody would capsize the boat. . .The total list was a mile long. If all those rules had been in effect everywhere, nobody could have possibly joined A.A. at all. 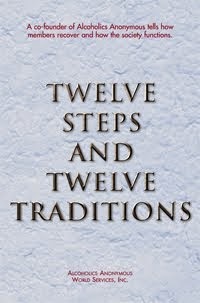 . .
I’m grateful that the Third Tradition only requires of me a desire to stop drinking. I had been breaking promises for years. In the Fellowship I didn’t have to make promises, I didn’t have to concentrate. It only required my attending one meeting, in a foggy condition, to know I was home. I didn’t have to pledge undying love. Here, strangers hugged me. “It gets better,” they said, and “One day at a time, you can do it.” They were no longer strangers, but caring friends. I ask God to help me to reach out to people desiring sobriety, and to, please, keep me grateful! The way we treat others often reveals our own state of being. When we are at peace, we’re most likely to treat others with respect and compassion. However, when we’re feeling off center; we’re likely to respond to others with intolerance and impatience. When we take regular inventory, we’ll probably notice a pattern: We treat others badly when we feel bad about ourselves. What might not be revealed in an inventory, however, is the other side of the coin. When we treat others well, we feel good about ourselves. When we add this positive truth to the negative facts we find about ourselves in our inventory, we begin to behave differently. When we feel badly, we can pause to pray for guidance and strength. Then, we make a decision to treat those around us with kindness, gentleness, and the same concern we’d like to be shown. A decision to be kind may nurture and sustain the happiness and peace of mind we all wish for. And the joy we inspire may lift the spirits of those around us, in turn fostering our own spiritual well-being. Just for today: I will remember that if I change my actions, my thoughts will follow. “Practical experience shows that nothing will so much insure immunity from drinking as extensive work with other alcoholics. Carry the message to other alcoholics. You can help when no one else can. You can secure their confidence when others fail. Life will take on new meaning for you. To watch people recover, to see them help others in turn, to watch loneliness vanish, to see a fellowship grow about you, to have a host of friends, this is an experience you must not miss.” Am I always ready and willing to help other alcoholics? One secret of abundant living is the art of giving. The paradox of life is that the more you give, the more you have. If you loose your life in the service of others, you will save it. You can give abundantly and still live abundantly. You are rich in one respect – you have a spirit that is inexhaustible. Let no mean or selfish thought keep you from sharing this spirit. Of love, of help, of understanding, and of sympathy, give and keep giving. Give your personal ease and comfort, your time, your money, and most of all, yourself. And you will be living abundantly. I pray that I may live to give. I pray that I may learn this secret of abundant living. “In some sections of A.A., anonymity is carried to the point of real absurdity. Members are on such a poor basis of communication that they don’t even know each other’s last names or where each lives. It’s like the cell of an underground. “In other sections, we see exactly the reverse. It is difficult to restrain A.A.’s from shouting too much before the whole public, by going on spectacular ‘lecture tours’ to play the big shot. Can We Fix Other People’s Problems? In Twelve Step work, we never run out of people who face serious problems. We’re often tempted to use our own expertise and resources to fix these problems for others. This can be a mistake. It is always risky to undertake such assignments without a great deal of thought and understanding. Such attempts to fix others usually deal only with symptoms rather than causes. Unless another person is totally helpless, the best course is to share experiences and knowledge with others, but to leave the problem solving to them. We should not encourage anyone to become dependent on us, nor should we set ourselves up as godlike individuals who have all the answers. We actually may be showing off instead of helping, and we may also be robbing others of the self-confidence and growth that come from fixing their own problems. I’ll share my experiences and hope today, while refraining from trying to fix people. I don’t have answers for everybody, and it’s wrong to believe I do. Love is something if you give away, you end up having more. Service is how we give love away. It’s the “self” of self-help. Service is not a duty; a gift that’s been given to us. We help ourselves by helping others. It’s how we make sure the program will be here tomorrow. We “carry the message.” It’s just one way we see how important we are to others. The world needs us. The world needs our love. Action for the Day: Which people could use a kind word and a little love? I will go visit them or give them a call. Part of my addiction was never listening to what people were saying. This was part arrogance, part denial, part fear, part control, part ego — the bottom line was that I did not listen. I was bored and unhappy with my life because I was a prisoner of my own thoughts. My spiritual awakening — which I consider a process rather than an event, a process that is still going on in my life on a daily basis — was in allowing some new information into my life that led to admittance and acceptance. The day that I was able to admit that I was an alcoholic was the day I took a step towards acceptance. Today I receive immense help and comfort from other people, especially recovering alcoholics. Two people experiencing an honest conversation are part of God’s promised love for His world. I’ll begin today with prayer — prayer in my heart, prayer in my mind, and words of prayer on my lips. Through prayer, I’ll stay tuned to God today, reaching forward to become that to which I aspire. Prayer will redirect my mind, helping me rise in consciousness to the point where I realize that there’s no separation between God and me. As I let the power of God flow through me, all limitations will fall away. Do I know that nothing can overcome the power of God? Today may I offer to my Higher Power a constant prayer, not just a “once-in-the-morning-does-it” kind. May I think of my Higher Power at coffee breaks, lunch, tea time, during a quiet evening — and at all times in between. May my consciousness expand and erase the lines of separation, so that the Power is a part of me and I am a part of the Power. To live an all-day Prayer. My disease of compulsive overeating is fueled by my regrets of the past and my fears of the future. The more I try to rewrite the past, (which of course I cannot do); the more I try to devise a future plan, (which usually does not come to pass), the less I am present for my life. I learn much from my three-year-old son. Sometimes when running to get a ball, he suddenly stops to look at an unusual insect he sees on the ground. His life flows and he abides by this pattern. He follows his heart and is “there” for life. When I consciously stay present for life — when I savor each moment and stay with my feelings — I am alive and living. In the present there is no worry, no fear, no regrets. I ask my Higher Power to help me to stay present for my life, to stay with whatever is happening at any given moment. I feel feelings. I am spontaneous and life is exciting and inspired. My life is run by choices and decisions. Every choice I make today will carry with it the consequences of that choice. Every decision I make today will carry with it the consequences of that decision. The question I will ask myself today is, “Do I want to be happy or do I want to be right?” Which ever one I choose will have a lot to do with the consequences I will experience today. If today was the last day of my life, what choices and what decisions would I make? So life has given us some dents. So what? Dents are necessary, besides being unavoidable and painful. Each dent is a part of the process that enables us to embrace life as a creative experience and to see the world in a new way, a way of compassion and understanding. Recovery is not a matter of escaping further blows or of disguising the dents we already have. It’s a matter of understanding what the dents mean and how we can work with them. Dents are neither soft spots in our characters that should make us ashamed nor saber scars that should make us proud. They are simply evidence that we have been alive for a while. Recovery offers us the chance to learn from our dents, to accept them as new spaces for growth. When we decide to see our dents as opportunities gained rather than opportunities lost, we stand much taller in our own eyes and in the eyes of others. Today, I will look on my difficult life experiences in a new light. Today, I will plant some seeds. You can’t swim like a fish, run like a deer, fight like a tiger or fly like a bird. Every one of your five senses is excelled by some member of the animal kingdom. Man, physically, has many superiors and would long since have been extinct but for the fact that he alone possess reasoning power. With this advantage he can build ships to outswim the fish, motor cars to outrun the deer, perfect weapons to outfight the tiger and airplanes to outstrip the fastest of birds. With this reason he can visualize the reason behind all Nature and thus avail himself of a Power greater than himself and all the forces with which he has to contend. Contains a great spiritual awareness. It is fundamentally without birth and death. Is this not the Buddha of Infinite Light? Big Book - Alcoholics Anonymous - More About Alcoholism, p. 30. "The idea that somehow, someday he will control and enjoy his drinking is the great obsession of every abnormal drinker. The persistence of this illusion is astonishing. Many pursue it into the gates of insanity or death." 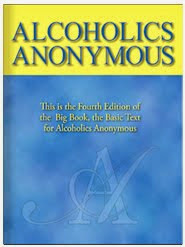 We are sure that humility, expressed by anonymity, is the greatest safeguard that Alcoholics Anonymous can ever have. Since there are no rules in A.A. I place myself where I want to be, and so I choose anonymity. I want my God to use me, humbly, as one of His tools in this program. Sacrifice is the art of giving of myself freely, allowing humility to replace my ego. With sobriety, I suppress that urge to cry out to the world, “I am a member of A.A.” and I experience inner joy and peace. I let people see the changes in me and hope they will ask what happened to me. I place the principles of spirituality ahead of judging, fault-finding, and criticism. I want love and caring in my group, so I can grow. No longer must we deny or regret our past. Once we’ve made our amends, what’s done is truly over and gone. From that point on, where we come from ceases to be the most important thing about us. It’s where we are going that counts. In NA, we begin to look forward. True, we live and stay clean just for today. But we find that we can begin to set goals, dream dreams, and look ahead to the joys a life in recovery has to offer. Looking forward keeps us centered in where we are going, not remorseful or regretful about our past. After all, it is hard to move forward if we are looking back. Just for today: The steps have freed me from regrets over my past. Today, I look forward to my new life in recovery. “We cannot get along without prayer and meditation. On awakening, let us think about the 24 hours ahead. We consider our plans for the day. Before we begin, we ask God to direct our thinking. Our thought lives will be placed on a much higher plane when we start the day with prayer and meditation. We conclude this period of meditation with a prayer that we will be shown through the day what our next step is to be. The basis of all our prayers is: Thy will be done in me and through me today.” Am I sincere in my desire to do God’s will today? Breathe in the inspiration of goodness and truth. It is the spirit of honesty, purity, unselfishness, and love. It is readily available if we are willing to accept it wholeheartedly. God has given us two things – His spirit and the power of choice – to accept or not, as we will. We have the gift of free will. When we choose the path of selfishness and greed and pride, we are refusing to accept God’s spirit. When we choose the path of love and service, we accept God’s spirit and it flows into us and makes all things new. I pray that I may choose the right way. I pray that I may try to follow it to the end. We cannot disclose anything to our wives or our parents which will hurt them and make them unhappy. We have no right to save our own skins at their expense. Such damaging parts of our story we tell to someone else who will understand, yet be unaffected. The rule is, we must be hard on ourselves, but always considerate of others. Good judgment will suggest that we ought to take our time in making amends to our families. It may be unwise at first to rehash certain harrowing episodes. While we may be quite willing to reveal the very worst, we must be sure to remember that we cannot buy our own peace of mind at the expense of others. This day I choose to spend in perfect peace. Today, let’s be gentle and kind. Lets talk to ourselves with love and respect. Let’s be gentle with others too. Today, let’s be clear in how we think, speak, and act. And if we start to get mixed up, let’s stop thinking and listen for our Higher Power’s voice. Today, we know that we have just a small job to do. It is to live today with love in our heart. We can’t take care of every problem in the world. But we make our actions today part of the answer instead of the part of the problem. Let’s Keep It Simple. Prayer for the Day: Higher Power, help me find Your calmness and peace in my heart today. Action for the Day: Do I believe that peace starts with me? Today, I’ll listen to the simple voice of peace inside of me. And I’ll Keep It Simple. Today in my recovery I know I am a student of Truth and will hopefully be so until the day that I die. No longer do I search for the cheap thrill or the quick fix — now I desire lasting truths. Spirituality is about finding God in things that are true and honest, good and wholesome, creative and positive. I battle daily with that sick side of me that is greedy, selfish and dishonest — I’m not perfect. Today I know that the sick and dishonest way of living does not work. My history teaches me that it does not work. I was never truly happy knowing that the gains came at the expense of others. Now I am a student in the “university of life”, and I enjoy learning something new about me every day. Today I am able to listen — listen to those who are wiser than I. I know that I do not have all the answers — and with this knowledge comes freedom. Prayer can have many rewards. One of the greatest rewards is the sense of belonging it brings to me. No longer do I live as a stranger in a strange land, alien in a completely hostile world. No longer am I lost, frightened and purposeless. I belong. We find, in The Program, that the moment we catch a glimpse of God’s will — the moment we begin to see truth, justice and love as the real and eternal things in life — we’re no longer so deeply upset by all the seeming evidence to the contrary surrounding us in purely human affairs. Do I believe that God lovingly watches over me? May I be grateful for the comfort and peace of belonging — to God the ultimately wise “parent” and to His family on earth. May I no longer need bumper stickers or boisterous gangs to give me my identity. Through prayer, I am God’s. I find my identity through prayer. "First you need only look." I learn much from my three-year-old son. Sometimes when running to get a ball, he suddenly stops to look at an unusual insect he sees on the ground. His life flows and he abides by this pattern. He follows his heart and is "there" for life. When I consciously stay present for life -- when I savor each moment and stay with my feelings -- I am alive and living. In the present there is no worry, no fear, no regrets. All life is a ceremony. Every act is a ceremony creating a result in our lives. Every ceremony we do always brings results to our lives. If we do bad medicine to others, we do bad medicine to ourselves. If we keep on doing bad ceremonies, we will eventually destroy ourselves. Any time we live our lives out of harmony, we are doing bad ceremonies. Any time we treat anything with disrespect whether it is another human being or a plant or an animal, we are performing bad ceremonies. These ceremonies not only have an effect on ourselves but will simultaneously affect everything. We need to use our power well, only do good ceremonies. Love at first sight is easy to understand. It’s when two people have been looking at each other for years that it becomes a miracle. True intimacy introduces us to ourselves. A loving relationship is the greatest therapy. When we first fall in love, we are filled with optimism and the greatest hopes for fulfillment of our dreams. We cling to all the best qualities of the person we fall in love with and we look past those things we don’t like. But living in an intimate partnership takes us beyond the edge of what we have learned. It is truly an adult developmental challenge. Most of us fall in love and soon find ourselves in over our heads. We haven’t had experience as adults in sustaining the openness and vulnerability we have walked into. We may gradually begin to feel too vulnerable and exposed. The relationship tests our ability to trust someone who has this much access to our inner self. We are tempted to become cranky, edgy, or overly sensitive. We may test our partner’s love by asking, If you love me, will you do such and such? We begin to try to control our partner so we don’t feel so vulnerable. All these temptations are holdover behaviors from our less mature selves. So we must reach for our more mature selves, breathe deeply, and trust that we can survive while being so close and vulnerable. Today I will turn to my Higher Power for guidance in going forward, in trust while being vulnerable. Most of us have met persons whom we thought extremely homely until we knew them better. Then we ceased observing their lack of facial beauty and began to appreciate those persons for what they really were. George Washington and Abraham Lincoln were what might be called extremely homely men, yet the beauty and strength of their characters was such that practically all present-day pictures show little of their ugliness. You can’t do a whole lot to improve an ugly face, but you can hide it behind a lovely character. Rely on your wisdom mind, not on your ordinary, judgmental mind. So it is important to remember that the true teacher, as we shall see, is the spokesman of the truth: its compassionate "wisdom display." All the buddhas, masters, and prophets, in fact are the emanation of this truth, appearing in countless skillful, compassionate guises in order to guide us through their teaching, back to our true nature. At first then, more important than finding the teacher is through making a connection with the truth of the teaching, for it is through making a connection with the truth of the teaching that you will discover your living connection with a master. Showing others who suffer how we were given help is the very thing which makes life seem so worth while to us now. . . . the dark past is . . . the key to life and happiness for others. Since I have been sober, I have been healed of many pains: deceiving my partner, deserting my best friend, and spoiling my mother’s hopes for my life. In each case someone in the program told me of a similar problem, and I was able to share what happened to me. When my story was told, both of us got up with lighter hearts. The Fifth Step asks us to share our true nature with God, with ourselves, and with another human being. It doesn’t encourage us to tell everyone every little secret about ourselves. It doesn’t ask us to disclose to the whole world every shameful or frightening thought we’ve ever had. Step Five simply suggests that our secrets cause us more harm than good when we keep them completely to ourselves. If we give in to our reluctance to reveal our true nature to even one human being, the secret side of our lives becomes more powerful. And when the secrets are in control, they drive a wedge between ourselves, our Higher Power, and the things we value most about our recovery. When we share our secret selves in confidence with at least one human being-our sponsor, perhaps, or a close friend-this person usually doesn’t reject us. We disclose ourselves to someone else and are rewarded with their acceptance. When this happens, we realize that honest sharing is not life-threatening; the secrets have lost their power over us. Just for today: I can disarm the secrets in my life by sharing them with one human being. “We must continue to take personal inventory and continue to set right any new mistakes as we go along. We should grow in understanding and effectiveness. This is not an overnight matter; it should continue for our lifetime. Continue to watch for selfishness, dishonesty, resentment, and fear. When these crop up, we ask God at once to remove them. We must not rest on our laurels. We are headed for trouble if we do. We are not cured of alcoholism. What we really have is a daily reprieve, contingent on the maintenance of our spiritual condition.” Am I checking my spiritual condition daily? Happiness cannot be sought directly; it is a byproduct of love and service. Service is a law of our being. With love in your heart, there is always some service to other people. A life of power and joy and satisfaction is built on love and service. Persons who hate or are selfish are going against the law of their own being. They are cutting themselves off from God and other people. Little acts of love and encouragement, of service and help, erase the rough places of life and help to make a path smooth. If we do these things, we cannot help having our share of happiness. I pray that I may give my share of love and service. I pray that I may not grow weary in my attempts to do the right thing. Men who cry for money and shelter as a condition of their sobriety are on the wrong track. Yet we sometimes do provide a new prospect with these very things–when it becomes clear that he is willing to place his recovery first. It is not whether we shall give that is the question, but when and how to give. Whenever we put our work on a material plane, the alcoholic commences to rely upon alms rather than upon a Higher Power and the A.A. group. He continues to insist that he cannot master alcohol until his material needs are cared for. Nonsense! Some of us have taken very hard knocks to learn this truth: that, job or no job, wife or no wife, we simply do not stop drinking so long as we place material dependence upon other people ahead of dependence on God. It would be nearly impossible to do an accounting of the results of prayer. Sometimes there seems to be no answer , and at other times, an answer seems to be the result of coincidence. It’s too easy to dismiss these results as things that would have happened even if we hadn’t prayed. Yet those of us who believe in prayer feel that it is indeed a way of communicating with our Higher Power. It takes many forms. Even thinking about God is a type of prayer. The best answers to prayer come in the new ways we begin to feel about ourselves and others. If prayer brings us to a realization of being in tune with our Higher Power, we are working in the right way. The proper changes will come into our lives as needed. We should not try to measure results, because this tends to bring doubt into the process. Our only responsibility is to pray then let God’s work take place in our lives. I will pray regularly to day, thinking often about God and asserting to myself and others that this Higher Power is in charge. The saints are the sinners who kept going. The saints are what our program calls the “winner.” We’re told to “stick” with the winners. Saints are just proven winners. They keep on believing in their Higher Power even when things get hard. There will be times when we’ll want to give up. We may want to stop going to meetings. We may want to get high. We may want to stop working the Steps. To be winners in this program, we need to follow the example of the saints. This means we live a spiritual life. We need to keep on going. One day at a time. Prayer for the Day: I pray that I’ll be a winner in this program. Higher Power, be with me in the easy times and the hard times. Help me keep going. Action for the Day: I’ll list people who are winners in this program. I’ll ask one of the how he or she keeps going in tough times. I was always so perceptive when it came to assessing the character faults of others. I could offer the best therapy and treatment to others; the best advice in the world. I was excellent at “pulling the covers” on a con-man — but always I missed me! I never really heard my insights. I never followed my advice. I always minimized my character faults. Usually what I saw in others was reflected in my own personality. The things I loathed in others existed in me. The anger and resentments came from a denial of self. In sobriety I hear the advice of others. I don’t always like it but I hear it. I give criticism and today I am growing in my acceptance of criticism. In relationships may I see clearly my own reflection. “Prayer does not change God,” wrote Soren Kierkegaard, “but it changes him who prays.” Those of us in The Program who’ve learned to make regular use of prayer would no more do without it than we’d trun down sunshine, fresh air, or food — and for the same reason. Just as the body can wither and fail for lack of nourishment, so can the soul. We all need the light of God’s reality, the nourishment of His strength, and the atmosphere of His Grace. Do I thank God for all that He has given me, for all that He has taken away from me, and for all He has left me? Dear H.P. ; I want to thank you for spreading calm over my confusion, for making the jangled chords of my human relationships harmonize again, for putting together the shattered pieces of my Humpty Dumpty self, for giving me as a sobriety present a whole great expanded world of marvels and opportunities. May I remain truly Yours, Yours truly. Prayer, however simple, nourishes the soul. These words, read every morning during prayer time, teach me to live as I am meant to live. Sanely and peacefully. Laid back. Patient and forgiving of myself. I am no longer a part of the war of the worlds. Anger can be dealt with or walked away from. Eating over it is no longer an option. Compulsive overeating is a problem I can live without, just for today. I will remember where I came from and how I got here so long as I keep in fit spiritual condition. Only through prayer can we make spiritual changes that are permanent. You have told us that all life is sacred. Today I intend to serve you, my Creator. Allow me to overcome temptation, and if one comes along, let me see the lessons that will give balance. You have told us that all life is sacred. Let me see today with a sacred eye. Let me see beauty in all things. My Creator, let me know what You would have me be today. Let my intentions be honest, respectful, humble, and loving. Success can only be measured in terms of distance travelled. We are forever moving from one experience to another, one challenge to another, and one relationship to another. Our ability to handle confidently all encounters is a gift of the program, and one that accompanies us throughout every day, providing we humbly express gratitude for it. Success is ours when we are grateful. We are not standing still. No matter how uneventful our lives may seem, we are traveling toward our destiny, and all the thrills and tears, joys and sorrows, are contributing to the success of our trip. Every day, every step, we are succeeding. We can reflect on yesterday, better yet, on last week or even last year. What were our problems? It’s doubtful we can even remember them. We have put distance between them and us. They were handled in some manner. We have succeeded in getting free of them. We have succeeded in moving beyond them. How far we have come! And we will keep right on traveling forward. As long as we rely on the program, we are assured of success. I can do whatever I need to do today, with success, when I humbly accept the program’s gifts. We have all had the pleasure of knowing intimately several men who might be classed as “Gentlemen of Leisure” and what a squirrel cage they were usually in. They labored all night long to get in jams that required a staff of lawyers all the next day to extricate them. Our goals should be entirely personal. No one knows us better than we know ourselves. There is only one universal goal : a gracious death with no regrets. FLOODED WITH FEELING - When a barrier to God collapsed, this self-described agnostic was at Step Three. When I first came to A.A., I thought everybody had drunk more than I had, that everybody had gotten into more trouble. But I kept coming to meetings, and after a while, I began to hear the beginnings of their stories. I came to realize that I was on the same road. I just hadn't gone as far--yet. Recovery Speaker - Grace W.
Nothing is really worth worrying about. Nothing is really worth getting angry or hurt or bitter about. Positively nothing is worth losing your peace of mind over. These important truths follow logically upon the following feet: You are going to live forever—somewhere. This means that there is plenty of time to get things right again if they have gone wrong. No matter what mistake you may have made, enough prayer will overtake it and cancel it. If those you love seem to be acting foolishly, you can help them with prayer to be wiser, and, meanwhile, if they suffer, it means that kindly nature is teaching them a lesson that they need to learn. But suppose something awful should happen? Well, what then? Suppose you lost everything and landed in the poorhouse. What then? Think what a wonderful demonstration you could make there, and you would probably learn several valuable lessons there, and, anyway, it would be quite interesting. Suppose the whole universe blew up. What then? When the dust settles, God will still be in business and you will be alive somewhere, ready to carry on. Cast thy burden upon the Lord, and He shall sustain thee: He shall never suffer the righteous to be moved (Psalm 55:22). I will center my thoughts on a Higher Power. I will surrender all to this power within me. I will become a soldier for this power, feeling the might of the spiritual army as it exists in my life today. I will allow a wave of spiritual union to connect me through my gratitude, obedience and discipline to this Higher Power. Let me allow this power to lead me through the orders of the day. May the steps I take today strengthen my words and deeds, may I know that the message I carry is mine to share, given freely by this power greater than myself. Active addiction is a smoldering death-wish. Each of us courted death every time we used. Our lifestyles, too, put us at risk. The life of an addict is sold cheaply with every day and every dose. In recovery, the first pattern we change is the pattern of using. Staying clean is the start of our journey into life. But our self-destructive behavior usually went far deeper than just our using. Even in recovery, we may still treat ourselves as if we are worthless. When we treat ourselves badly, we feel badly. And when we feel badly, we seek relief-maybe even in our old solution, drugs. Choosing recovery means choosing life. We decide each day that we want to live and be free. Each time we avoid self-destructive behavior, we choose recovery. Just for today: I will choose life by choosing recovery. I will take care of myself. “We must be willing to make amends to all the people we have harmed. We must do the best we can to repair the damage done in the past. When we make amends, when we say: ‘I’m sorry,’ the person is sure at least to be impressed by our sincere desire to set right the wrong. Sometimes people we are making amends to admit their own faults, so feuds of long standing melt away. Our most ruthless creditors will sometimes surprise us. In general, we must be willing to do the right thing, no matter what the consequences may be for us.” Have I made a sincere effort to make amends to the people I have harmed? The grace of God cures disharmony and disorder in human relationships. Directly you put your affairs, with their confusion and their difficulties, into God’s hands. He begins to effect a cure of all the disharmony and disorder. You can believe that He will cause you no more pain in the doing of it than a physician that knows how to effect a cure would cause a patient. You can have faith that God will do all that is necessary as painlessly as possible. But you must be willing to submit to His treatment, even if you cannot now see the meaning or purpose of it. I pray that I may willingly submit to whatever spiritual discipline is necessary. I pray that I may accept whatever it takes to live a better life.